I was snooping around the online archives of the Texas General Land Office and found this document. It’s for John Neely Bryan, the founder of the city of Dallas. Bryan came from Tennessee in the 1839 to establish an Indian trading post at a natural ford along the Elm Fork of the Trinity River. Here, he dealt with bison hides taken from the Grand Prairie. He enticed fellow Tennesseans and other settlers to follow him to this little hamlet, which became a much safer place for Americans after Sam Houston negotiated peace treaties with Wichita tribes and Comanche bands at nearby Tehuacana, Fort Bird, and Grapevine Springs. By 1841, the Peters Colony Land Grant Company was charged with distributing land in North Texas, which included the Dallas area. After a string of disputes by settlers who arrived prior to the company’s empressario (land grants based on Spanish law), and alleged records mismanagement that led to the burning of land records in today’s Denton County, Bryan retroactively certified his 640 acre homestead through this document in 1854. The Spanish system of empressarios (original land grants) is still in place in Texas, unlike any other state of the Union. In order to obtain the maximum grant, one had to be a married man, too. This document helps to explain that. I took up a new hobby last year – estate sale shopping. Like my “hobby” of ghost town collecting, this new pastime does not require amassing a large collection of finds that I have to find storage for, however. Going to estate sales is, for me, simply another way to satiate my nosiness. But I have to make myself clear; I’m not nosy about other people’s possessions. Rather, I like to go inside houses to savor, comment, critique, enjoy, and marvel at their architecture. And the older the house, the better. At the Dallas-area estate sales I frequent, I have the opportunity to visit early and mid-century homes that had been owned by one family for decades. After the last of the parental generation dies off, their possessions go on sale and the house itself is also up for grabs. Often, that means that the house will no doubt become bulldozer fodder as the new homeowners wish to transform geographically desirable addresses into fashionably designer homes with the latest accouterments. I could pretend to be understanding in their desire to tear down the older homes to build more modern ones. It’s their money, right? And everyone wants the latest conveniences, right? But I’d be lying. I LIKE the older homes. I think pink, tiled bathrooms, with built-in toothbrush holders, are awesome. I cannot contain my enthusiasm when I encounter a vintage metal kitchen, often painted in a cheery yellow. Massive brick fireplaces with wooden mantles, built-in corner china cabinets, transoms, stained-glass windows, arched doorways, crystal door knobs, telephone nooks, linoleum, shag carpeting, scuffed wooden floors, decorative plaster… I’m a big fan. Estate sales offer the rare opportunity for me to see these hidden gems before they’ve been demolished, and without having to employ a real estate agent, either. Visiting these sales is like capturing a small moment in time, before the future obliterates the past. I took the Texas Eagle from Dallas to Chicago the other week, and had a great time doing so. There’s nothing like falling asleep to the clickity-clack of the rails, and waking up to see the mighty Mississippi River sparkling under the morning sun. I’ve been to Chicago many times before. I’ve flown and driven, but nothing beats entering this grand city on the train. While it’s not the most scenic route – I saw plenty of hobo camps and abandoned car parts (and a whole car or two!) – I got a real sense of the city just by looking at its industrial and residential landscapes roll by. Chicago’s a compact city, with high urban density and a fantastic public infrastructure. It’s what a city SHOULD be like. And then, sigh, the Eagle and I glided back down through the Dallas. Dallas is the very opposite of Chicago in terms of its architecture and infrastructure – it’s a sprawling, meandering urban conglomeration with housing that looks like warehouses and vast stretches of empty, abused, and misused land. Watching the weed-strewn lots and urban blight roll by, I became almost obsessed with the questions that have bogged my mind for a long time: why does Dallas planning not seem to have any rhyme or reason? Why are the suburbs competing with, rather than enhancing, the city? In terms of development, Dallas is about 50 years younger than Chicago – not so far apart at all. But they’re worlds apart when you look at how their growth has been managed. Chicago built up – Dallas built out. Chicago made room for trains and cars. Dallas forgot trains and relied too much on cars. Chicago didn’t allow its sports stadiums to leave the city. Dallas lets sports owners move to suburbs where public transportation is nonexistent. Chicago built around its river, which meanders through the heart of the city. Dallas turned its back on the Trinity River, and straightened it out so much that it has now become a lonely creek. 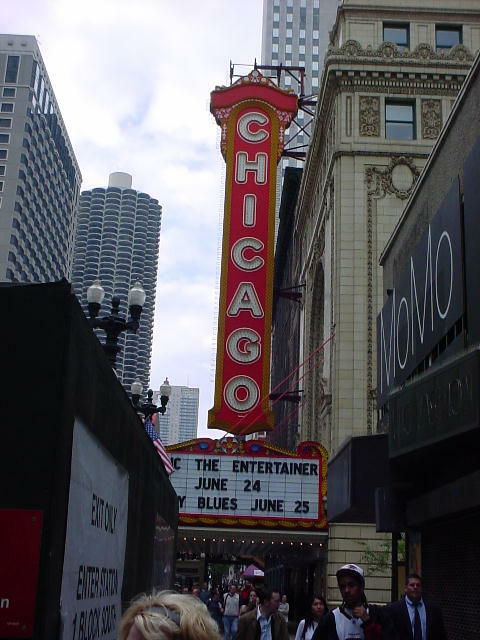 Chicago has culture with world-class museums, art exhibits, and sculptures on public squares. Dallas neglects its cultural gem, Fair Park, in favor of shiny new developments that are devoid of life – like Victory Park. Oh, and Chicago allows visitors to go up the Sears/Willis Tower. 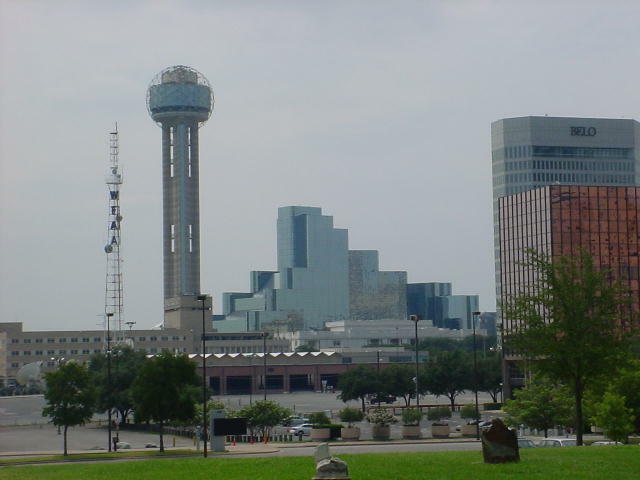 Dallas’ number one tourist attraction, Reunion Tower, has been closed for three years now, and no one has been able to go up to enjoy the view except customers of a restaurant now owned by celebrity chef, Wolfgang Puck. I’ve said it before and I’ll say it again – I think Dallas is awesome. Maybe that’s why I get so worked up over what I think Dallas COULD be. The new issue of D Magazine posits 119 reasons why it loves Dallas. Some of the reasons were a little on lopsided – for example, the article gives 6 points to Jimmy’s Food Store, an Italian grocery market. Then, it counts 39 reasons in the form of celebrities who used to live here. And for some reason, D Magazine claims that Dallas is the “Hollywood of Reality TV.” Is that really a reason to love Dallas, or to snicker at its wanna-bes? All in all, though, it was a good list. I give it a lot of points for mentioning Jack Kilby (the inventor of the microchip), and for paying tribute to the Longhorn Ballroom. There is one GLARING omission, however – it said nothing of Dallas’ history, architecture, events, etc. So, I thought I’d write a little something on reasons I love Dallas, with photos, of course. #1 – The Old Pioneer’s Cemetery in Downtown Dallas. A wire-wrapped crib for the deceased Annie at the Pioneer Cemetery in downtown Dallas. You can get an eerie feeling upon seeing this neglected cemetery. Sitting in the middle of some of Dallas’ most prominent structures, the cemetery seems to call out from a more peaceful, simpler time. But with planes droning overhead and trucks thundering across the freeway in the distance, “restful” doesn’t readily come readily to mind here. But I’m not sure the current residents of the cemetery would mind the noise much. After all, they constitute Dallas’ early civic leaders, business people, and benefactors, such as Sarah Cockrell, James Latimer, and many members of the Stemmons family, for whom Interstate 35 E is named after. Because the Convention Center, City Hall, and other businesses threatened to encroach on the cemetery – the Santa Fe railroad had cleared several graves in the early 20th century to make way for railroad tracks – Frances James of the Dallas Historical Society worked very hard to make this cemetery a city landmark. Mrs. James is the reason for the next entry, actually. Mrs. James conducts the cemetery tours for the Dallas Historical Society. When I went on the tour, we visited the Freedman’s Cemetery in the State Thomas Neighborhood, and we also found the graves of the Millermoore family and their slaves in a backyard in South Dallas. John Neal Phillips, author of Running with Bonnie and Clyde: The Ten Fast Years of Ralph Fults, conducts the Bonnie and Clyde Tour every May. Ken Holmes offers tours on fun Dallas history and the Kennedy Assassination. The incomparable Rosemary Rumbly weds hilarity and history in her tours of Oak Cliff. The tours are very cheap – roughly $45 per person, and includes transportation and a meal – you can’t beat that! By the way, the Millermoore plantation house, built in the Greek revival style and supposedly haunted, now sits at the wonderful Dallas Heritage Village, which is reason #3 why I love Dallas. The Millermoore mansion at Dallas Heritage Village. An outdoor museum built on the site of Dallas’ first city park, entering the Dallas Heritage Village is like taking a step back in time. The buildings show not only a time line of Dallas’ historical occupation, but also demonstrate the diversity of the city. The most lovely event of the year, however, is reserved for December. The park is lit up with candles, carolers make their rounds, hot Dr. Pepper and popcorn are served. Each house is open to demonstrate different traditions – a pioneer Christmas in the 1850’s dog-trot farm; Chanuka preperations in the colorful Queen Anne house; and cooking tamales and sweets inside the Mexican-occupied railroad house. For five years now, I start out my Christmas season with a trip to Candle Light at Dallas Heritage Village. Though there are plenty more reasons to love Dallas, these three are on the top of my list. But I could go on – Keller’s Hamburgers on Harry Hines Boulevard, served on poppy seed buns! El Centro College, with its campus in the middle of downtown! The 7th Floor of the Dallas Public Library! The HUGE aligator snapping turtle that swims in the lagoon at Fair Park and likes to eat donuts! You can watch a lot of fun things from the parking lot at Keller's Drive In, including hookers and "exotic" dancers getting off work. Hmm… contemplating these entries was so much fun, I think I’m going to give a “top 3” for Fort Worth, next! I wouldn’t call myself a real cyclist – I don’t wear spandex (Lord help the person seeing me if I did!) and I don’t look for challenging trails and death-defying grades. All I want is a smooth ride, pretty scenery, and relative safety as I travel around on my Sun 3-speed, beach combing bike. Yes, it has a spring-loaded seat, fenders and a basket. I never claimed to be cool. While I enjoy riding around town on my granny bike, I also like to find quiet trails around DFW. Because I don’t want to do dishes right now, I’ve decided instead to regale my non-existent readers (? Maybe there’s one or two out there…) with a list of the good and not-so-good bike trails I’ve discovered. I’ll add more to the list as time and enthusiasm permit. Texas State Trail between Weatherford and Mineral Wells (with trail heads in between, including at Lake Mineral Wells State Park). The trail is formed from an old railroad bed, so it’s mostly even. 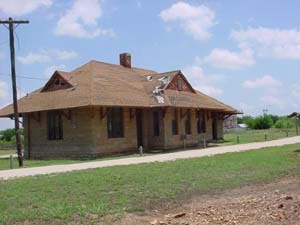 You can ride the trail all the way to the old depot at Mineral Wells, which sits in the shadow of the old Baker Hotel. There are many restaurants and stores along the way, but watch some of the road crossings, because motorists aren’t watching for you! Weatherford is 12 miles from the trail head at the state park; Mineral Wells is 6 miles away. Fort Richardson State Park in Jacksboro, Texas: Even if there wasn’t a bike trail, this would still be my favorite state park, because the fort and its history are absolutely fantastic – scenic and interesting at the same time! The bike trail goes up and down some very rugged landscape and winds around Lake Jacksboro in a 12 mile loop. Along the way, interpretive signs and old ruins of bridges, mills, and baptizing facilities offer plenty of diversions. Some weirdness prevails, too, like this one house-on-stilts with a makeshift boat dock where 80s heavy metal is always playing at high decibles; and the airport and runway next to the trail that seem desolate and forgotten. Lake Ray Roberts Greenbelt near Denton, Texas: I’ve been on this trail many times, and while it’s not my favorite – too many trees and not enough points of interest – it’s a great, peaceful ride with level paths and some unexpected wildlife (including cottonmouths). The trail goes all the way from US 380 east of Denton to Lake Ray Roberts State Park, which is about 11 miles all in all. You cannot access the beach at the lake from the trail, but maps do not make that clear. More than once, I’ve had to tell people who were walking along the trail with beach towels in hand that theirs was a futile endeavor. Chickasaw National Recreation Area at Sulphur, Oklahoma: The trail at this national park is not the best for granny bike riding, but it’ll do. Lots of hills make this one a challenge, and the trail isn’t very long, either. However, it’s well worth the time because it takes you from the interpretive center to the smelly Sulphur springs from which the town gets its name. Another, foot-only trail leads to two bubbling springs that were encased in overly- enthusiastic stone work by the CCC during the 1930s. Bonham State Park in Bonham, Texas: The park merely surrounds a very small lake and is really nothing to write home about, but the trails make for good mountain biking (rugged, stone-laden, and tight). I prefer a smoother ride where I don’t have to constantly worry about the next obstacle in the way, but to each her own. I did see a lot of insect and arachnid life while I was out there, including large wolf spiders and tarantulas. That’s an endorsement, by the way – I think spiders are cool. The only dangerous spiders in Texas are black widows and brown recluses, so the bigger, hairy ones, while creepy, are fairly harmless, though they may bite! 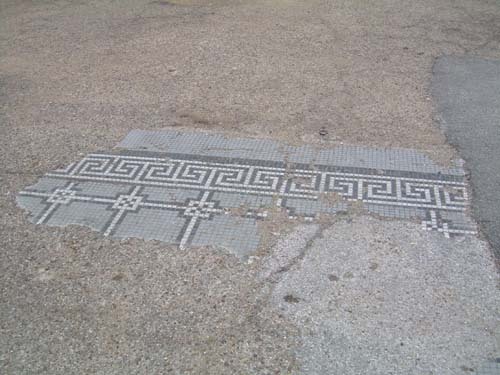 The tiled floor peaks out from underneath the asphalt of a parking lot in downtown Dallas reminds me of what has been lost. Passenger service to St Louis from Dallas via the Texas and Pacific – now, the Amtrak takes the intrepid traveler to that destination. I know there are many, many people out there who have a low opinion of Dallas (I’m not naming names, but you know who you are). Fortunately, I’m not one of them. I think Dallas is pretty nifty. Yes, some parts are ugly, there are WAY too many ‘iffy’ neighborhoods, and the differences between the ‘haves’ and ‘have-nots’ are palatable. And, besides the always insightful and slightly neurotic Dallas Observer, the city only has one newspaper. However… Dallas is a real card. This city tries to be fancy and cosmopolitan, but its shady little past always keeps popping up in the most unexpected places. I took a drive through Dallas the other day to visit a bunch of sights -the Texas Theater in Oak Cliff, Old City Hall, Old Red Museum, JFK Memorial (you know, the usual Kennedy tour) and while moseying around, I spotted some very interesting hints of what Dallas used to be like. 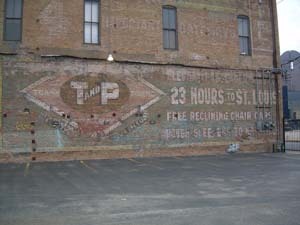 On Elm Street, just south of the US 75 bridge, one can see an old Texas and Pacific advertisement painted on the side of a commercial building – a tribute to Deep Ellum’s railroad past, where the T&P would lumber on Pacific Avenue, the next street over. 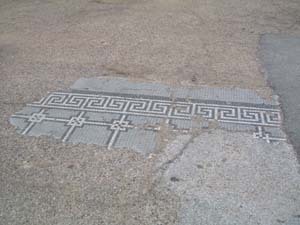 In a parking lot just a few blocks up from Deep Ellum are the remains of what once was a magnificently tiled floor of some poor, demolished building.